The number and value of Lightning Network channels increased enormously in March, going from ~35,000 open channels containing 740 BTC to nearly 44,000 channels holding 1,072 BTC. Lightning Network growth during the highlighted month of March, courtesy of P2SH.info. Although these gains have largely leveled off since the end of March, it appears that the smart money is betting on the continued rapid growth of the Lightning Network. Jack Dorsey, CEO of both social media giant, Twitter, and Square, the payments app, demonstrated his strong support for both Lightning and Bitcoin during early 2019. In February, Dorsey revealed the Lightning will soon feature in Square’s Cash app, which has allowed users to buy bitcoin since late 2017. Shortly before the start of March, Square reported a new record of $52 million in BTC exchanges conducted via its app during the last quarter of 2018, making it the most popular way to buy Bitcoin via iPhone. Square also disclosed a holding of $200,000 in BTC at the end of 2018. Currently, the Square app only allows United States users to trade bitcoin although the company also provides financial services in Canada and Japan. Dorsey has also made it clear that Square is dedicated to Bitcoin, so don’t expect support for altcoins like Ethereum, Ripple / XRP, Litecoin, or Cardano any time soon. 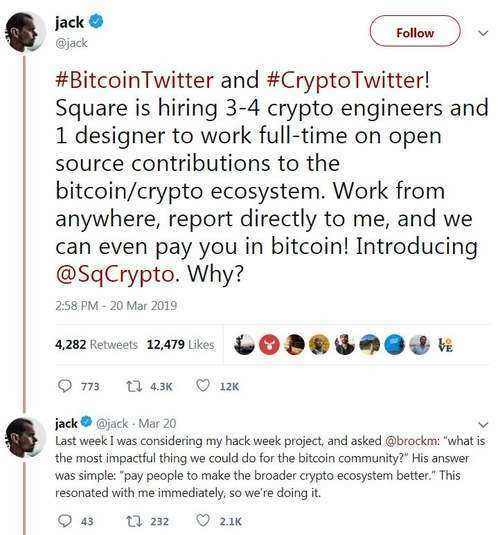 On the 20th of March, Jack Dorsey announced via Twitter that his other company, Square, is hiring crypto developers and designers. Surprisingly, this new team won’t be working on integrating Bitcoin transactions into the Square app. Instead, these crypto professionals will be tasked with contributing to open source crypto development. Square is paying people to improve Bitcoin and crypto for the benefit of the whole ecosystem. Just before the start of March, it was announced that the US government had recovered and returned a small portion from a huge cache of stolen bitcoins. Bitfinex, a large crypto exchange, was hacked for 120,000 BTC back in August of 2016. An amount of 27.7 BTC was returned to the exchange, which then passed the coins on to certain affected customers. While only a token amount, this story signaled that a degree of two-way cooperation exists between crypto exchanges and law enforcement. On the 8th of March, news broke that one of the operators of the infamous OneCoin ponzi scam was arrested. OneCoin raked in nearly $4 billion in investment since it began in 2014, despite having no publically-accessible code, blockchain, or any other verifiable elements of a genuine cryptocurrency. Konstantin Ignatov, brother to the scam’s creator; so-called “cryptoqueen,” Ruja Ignatov, was taken into custody at Los Angeles International Airport by federal agents. Mark Karpeles is another name associated with misdeeds in the Bitcoin space, specifically the largest exchange hack in history, in which about 850,000 bitcoins went missing. The former Mt. Gox CEO received a two and a half year suspended sentence from a Japanese court on the 15th of March. Karpeles was charged with data tampering but cleared of the more substantial charge of embezzling $3 million in client funds. Karpeles thus escaped the 10-year prison sentence requested by the prosecution and will remain at liberty unless he’s convicted of another offense. Finally, a report made in early March to the United Nations Security Council revealed some surprising geopolitical and blockchain elements to over 1,600 recent cyber-attacks. The report accuses the North Korean regime of using cyber-attacks to steal an estimated $670 million in foreign currencies. The cyber-attacks were said to have been carried out between 2015 and 2018. The report further accuses North Korea of using cryptocurrency to evade sanctions, as well stealing $571 million in cryptocurrency directly from 5 Asian crypto exchanges, which were hacked between the start of 2017 and late 2018. North Korea also stands accused of hacking two banks and the central bank of Bangladesh. On March 5th, Russia’s State Duma, or parliament, adopted the second reading of a bill addressing “Digital Financial Assets.” The bill’s purpose is to build a regulatory framework for cryptocurrency. Russian President Vladimir Putin recently urged the need to put such legislation in place by July of 2019. In further Russian regulatory news, a proposal by Russia’s former energy minister, Igor Yusufov, for the creation of a regulated cryptocurrency backed by the oil reserves of Russia and OPEC member states is currently pending in the Duma. March reporting from Argentina suggests that cryptocurrency is a high administrative priority. Firstly, Argentina’s Ministry of Production and Labour matching private investments into a blockchain accelerator project already earmarked for $50,000 in government funding. Secondly, Argentina’s President, Mauricio Macri, met up with well-known Bitcoin investor, Tim Draper, on the 22nd of March. Draper bet President Macri that if the value of the Argentinian peso outperforms Bitcoin over a specified period, Draper will double his investment into Argentina’s burgeoning crypto industry. Finally, some rather unique crypto legislation came out of Thailand’s Securities and Exchange Commission in early March. The agency banned Litecoin, Bitcoin Cash, and Ethereum Cash for investment and trading purposes, as well for ICO funding, across all the nation’s exchanges. Bitcoin, Ripple, Ethereum, and Stellar were all approved for such usages, however. This is perhaps the first time a government agency has displayed a preference for certain altcoins over others, although the reasoning behind their decision remains unclear.